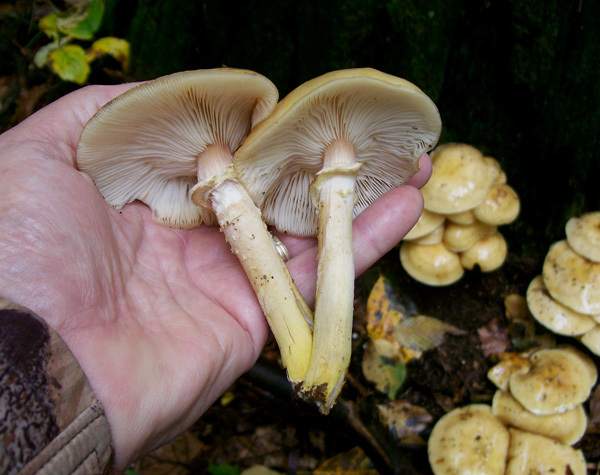 It is now pretty well known that the "aborted form" is a Honey mushroom - Armillaria - and NOT an Entoloma abortivum. rather than as it appears to denote with a name of "Aborted Entoloma". 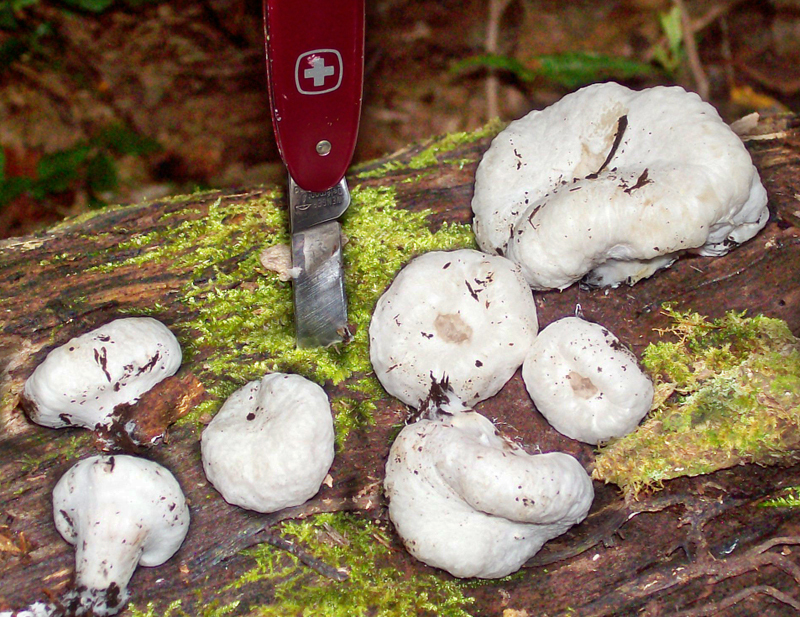 The "normal form" however remains Entoloma abortivum. I know. It's all very confusing. I am just biting the bullet and naming it Aborted Armillaria / Armillaria abortivum. It's bad enough that Honey mushrooms are a 'complex' - with a lot of confusion. Now we have Honey mushrooms that are deformed / aborted. This article is about my personal experience collecting and eating the "Aborted form" only. Anyway, I have been collecting and eating the aborted looking form for 35 years. Although there were occasions in that time span when perfectly formed Entoloma abortivums were present while collecting the globs, I never picked any to eat. 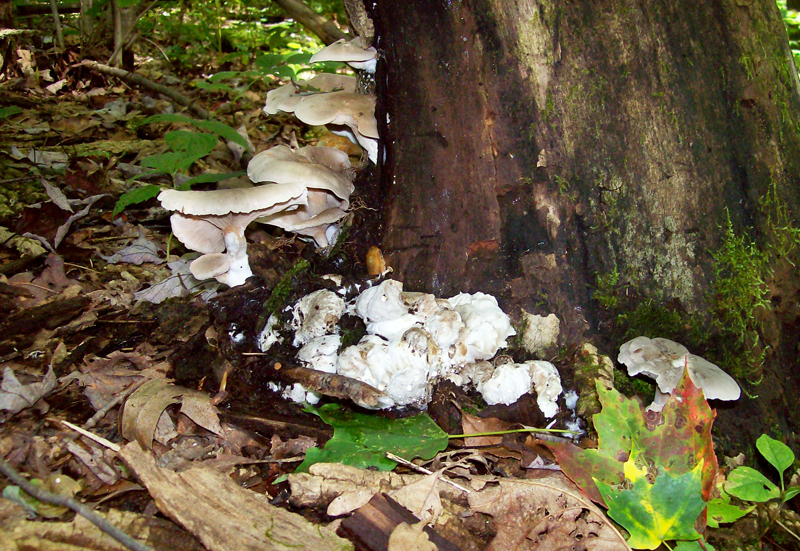 Here you can see the regular forms of Entoloma abortivum on the left side of tree. All the field guides I had amassed over the years recommended that the safe route was to pick the aborted forms and if you did pick the normal forms of Entoloma abortivum for eating to do so only if they were in very close proximity to the aborted form. I chose to only pick the aborted form all those years. I find them tasty and I like the texture when cooked. That's me though. I particularly enjoy them for breakfast with eggs. The eggs do not have any overpowering flavor to detract from the mild flavor of these mushrooms so that makes them perfect. Plus there are usually lots of these when they appear. I like it when there are lots. Of course, everyone has a different opinion about what a mushroom's appeal is so you will have to determine it yourself. Since I have always enjoyed Honey mushrooms over the decades it comes as no surprise that these aborted forms that I have been enjoying in the same time span are actually Honey mushrooms. 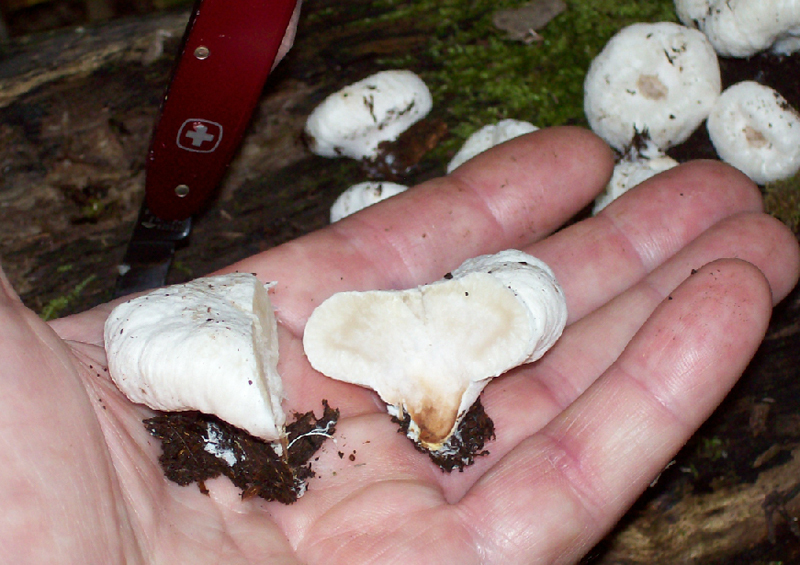 It used to be believed that the aborted form was an Entoloma abortivum that had been parasitized by Armillaria spp. which somehow affected the way it grew, ultimately deforming the fruit body. Since it is now pretty well confirmed that it is the other way around, that is, that Entoloma abortivum parasitizes the parasite Armillaria, deforming it's fruiting body, I can say I never ate an Entoloma. So, if you have been eating these aborted forms then you have been eating Honey mushrooms like those shown below. Hard to imagine that those tan colored Honey's in my hand could actually look like white, deformed globs. 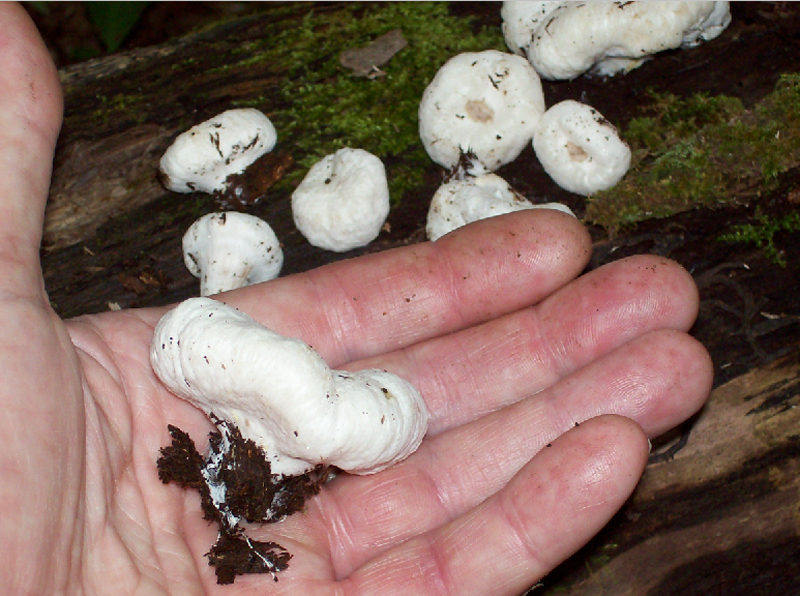 Do what I have done for decades and if you find perfectly formed Entoloma abortivum fruiting bodies along with the whitish, deformed globs leave the perfect ones behind and grab these. The deformed Armillaria's will have a delicate lumply cottage cheese appearance. Many will be tire shaped. There will be no gills found. A stem is non existent or if present will just look like an afterthought. If you cut the fruiting body in half you will see some marbling that could have some pinkish or light brownish in it. 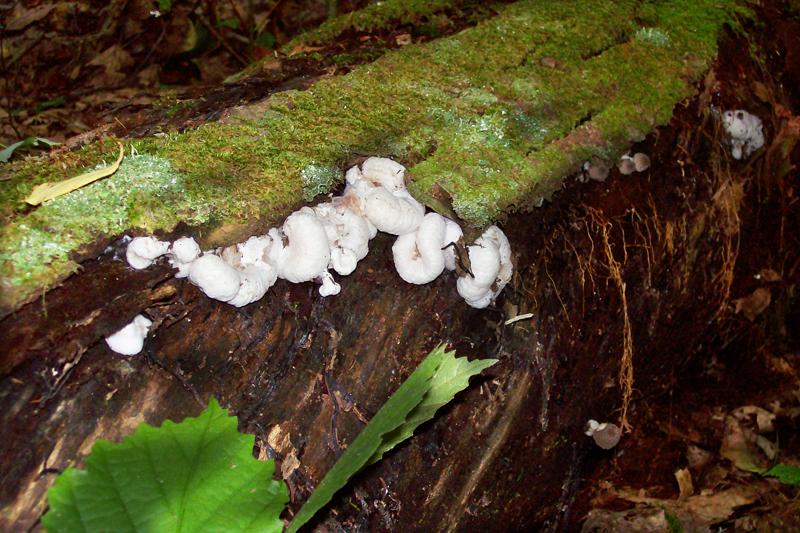 These mushrooms often will be found growing on wood. If it looks like they are growing on the ground it is probably because there is buried wood - just like what Honey mushrooms appear to do. Best practice - pick only the ugly deformities for eating. Pick the small ones from the group. They will be more firm and will cook up delectably. Armillaria abortivum - A/K/A Aborted Armillaria. DATE - Late August through fall. FOUND - Laurel Hill State Park, Bakersville, Pa. area. Kooser State Park. Forbes Forest in Jones Mill area. 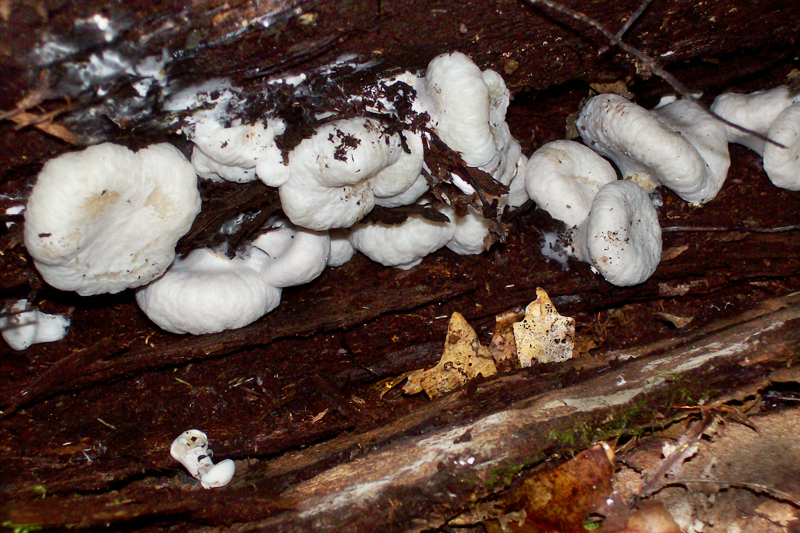 Several clusters were found on both sides of an old oak stumps. Perfect Honey mushrooms are also around on occasion. Weather conditions: Best when it has been wet.